Kenny began as a postdoctoral researcher at the Reserve in 2000 and has served as its Research Coordinator since 2002. 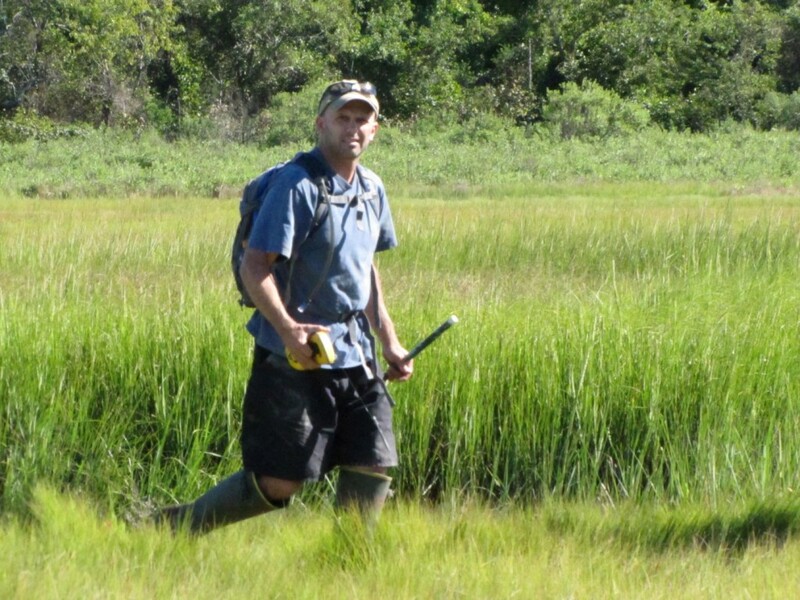 Prior to that, Kenny received a Ph.D. from the Graduate School of Oceanography at the University of Rhode Island, where his research focused on the effects of salt marsh hydrologic restoration projects. Kenny has continued his salt marsh research throughout his tenure at the Reserve, where he currently focuses on marsh responses to sea-level rise, marsh crab impacts, and assessing various types of adaptation projects aimed at building marsh resilience to sea-level rise over time. Kenny also coordinates all visiting researchers to the Reserve, sits on numerous committees and workgroups both locally and nationally, and is especially interested in facilitating data synthesis projects across the NERRS at the regional and national levels. Raposa, K.B., K. Wasson, E. Smith, S. Lerberg, and 12 additional co-authors. In review. Assessing tidal marsh resilience to sea-level rise at broad geographic scales with multi-metric indices. Global Change Biology. Raposa, K.B., M.L.C. Ekberg, D.M. Burdick, N.T. Ernst, and S.C. Adamowicz. In review. Elevation change and the vulnerability of Rhode Island (USA) salt marshes to sea-level rise. Regional Environmental Change. Raposa, K.B., S. Lerberg, C. Cornu, and 7 additional co-authors. In review. Evaluating tidal wetland restoration performance using National Estuarine Research Reserve system reference sites and the Restoration Performance Index (RPI). Estuaries and Coasts. Raposa, K.B., R.L. Weber, M.C. Ekberg, and W. Ferguson. In press. Vegetation dynamics in Rhode Island salt marshes during a period of accelerating sea level rise and extreme sea level events. Estuaries and Coasts. doi: 10.1007/s12237-015-0018-4. Watson, E.B., C. Wigand, E.W. Davey, H.M. Andrews, J. Bishop, and K.B. Raposa. In press. Wetland loss patterns and inundation-productivity relationships prognosticate widespread salt marsh loss for southern New England. Estuaries and Coasts. doi: 10.1007/s12237-016-0069-1. Raposa, K.B. and M. Chintala. 2016. Comparison of bottomless lift nets and Breder traps for sampling salt marsh nekton. Transactions of the American Fisheries Society 145:163-172. Wigand, C., H. Smith, C. Spears, B. Keith, R. McKinney, M. Chintala, and K. Raposa. 2015. Relationships of modeled nitrogen loads with marsh fish in the Narragansett Bay Estuary, Rhode Island. Northeastern Naturalist 22:1-9. Raposa, K.B., R.A. McKinney and S. Millar. 2013. Songbird responses to land preservation within southern New England cluster subdivisions. Journal of Sustainable Development 6:26-42. McKinney, R.A. and K.B. Raposa. 2013. Factors influencing expanded use of urban marine habitats by foraging wading birds. Urban Ecosystems 16:411-426. Raposa, K.B. and D.M. Talley. 2012. A synthesis of nekton responses to New England salt marsh tidal restorations. In C.T. Roman and D.M. Burdick (eds. 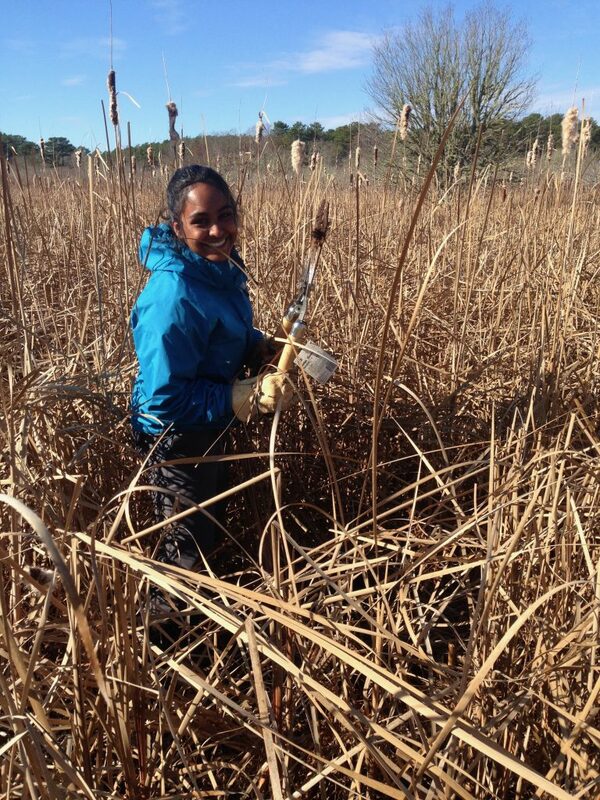 ), Restoring Tidal Flow to Salt Marshes: A Synthesis of Science and Management in New England (USA). Island Press. Daisy joined the Narragansett Bay National Estuarine Research Reserve as a Marine Research Specialist II in May 2008. Daisy is in charge of running the abiotic component of the System Wide Monitoring Program (SWMP). She collects, analyzes, and summarizes water quality, nutrient, and meteorological data in order to identify short-term patterns and long-term trends. 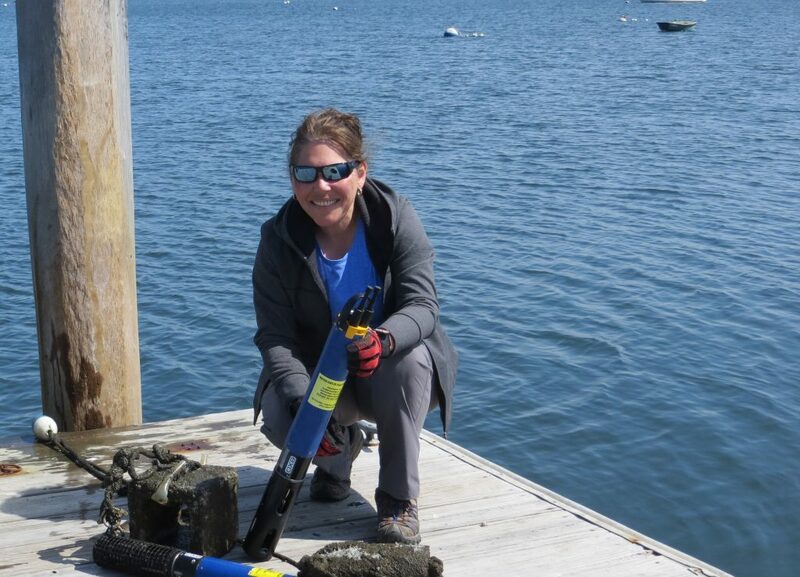 Daisy has more than twelve years of experience working as a marine benthic ecologist and is currently working on a project that will characterize, for the first time, the benthic infauna community around Prudence Island. A baseline characterization of the infauna will help detect changes in the population over time and determine if those changes are correlated to water quality or nutrient variations around Prudence Island. She has worked in the Caribbean as an environmental consultant looking at the effects of industrialization and coastal development on the marine environment and on marine benthic communities such as seagrass, corals and other benthic invertebrates. Daisy’s research interests include the effects of anthropogenic disturbances and climate change on marine benthic communities, and the conservation of marine ecosystems and habitats. In her free time she enjoys diving, biking, hiking, and playing with her puppies. Durant, D., K.B. Raposa, M. Cole, and W. Ferguson. 2015. Formation and rapid recovery of vegetation dieback patches in Narragansett Bay, RI Salt marshes. Poster presentation. Poster Presentation. New England Estuarine Research Society, April 16-18, Bristol, RI. Durant, D., K.B. Raposa, I. Mateo. 2013. Predicting the effects of climate change on Hemigrapsus sanguineus populations in intertidal cobble beaches. Poster Presentation. 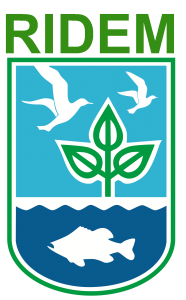 22nd Biennial Conference of the Coastal and Estuarine Research Federation, November 3-7, San Diego, CA. Durant, D., and K.B. Raposa. 2012. Preliminary Results of the Benthic Infaunal Monitoring at the Narragansett Bay National Estuarine Research Reserve. Poster Presentation. New England Estuarine Research Society, Annual Spring Meeting, Plymouth MA. April 11-13 2012. Mateo, I., D. Bengtson, E. Durbin, R. Kingsley, P. Swart and D. Durant. 2012. Spatial variations in otolith chemistry in tautog Tautoga onitis in the US Coast. Northeastern Naturalist 19(2):201-2016. Durant, D., and K.B. Raposa. 2011. Water quality, nutrients, and meteorological trends at the Narragansett Bay National Estuarine Research Reserve in 2009. Tech. Rep. Ser. 2011:1. Mateo, I., E.G. Durbin, D.A. Bengtson, and D. Durant. 2011. Variations in growth of tautog in nursery areas in Narragansett Bay and Rhode Island Coastal Ponds. Marine and Coastal Fisheries. 3(1):271-278. Mateo, I., E.G Durbin, D.A. Bengston, R. Kingsley, P.K. Swart, D. Durant. 2010. Spatial and temporal variation in otolith chemistry for tautog (Tautoga onitis) in Narragansett Bay and Rhode Island coastal pond. Fisheries Bulletin. 108:155-161. Vicente & Associates, Inc., Caribbean Engineering and Environmental, Inc., and Daisy Durant. PHASE 3. Biological Monitoring Program Plan Implementation: 2005-2007. EcoEléctrica Co-Generation Project. Chapter 8: Corals Small Spatial Scale Study. February 27, 2008. Pp. 46. Durant, D. 2006. Environmental Monitoring for Improvements to the Ann E. Abramson Marine Facility in Frederiksted, St. Croix. Photoquadrat Study, February 10 to November 30, 2006. Final Report, December 12, 2006. Submitted to Natural Resource Consultants, Inc., St. Croix, USVI. Pp. 93. Durant, D., 2006. VIPA Water Quality Monitoring at the Ann E. Abramson Marine Facility, St. Croix, USVI. Sedimentation at the pier, February 10 to October 31, 2006. Final Report, December 12, 2006. Submitted to Natural Resource Consultants, Inc., St. Croix, USVI. Pp. 27. We welcome Nia Bartolucci as our Seasonal Research Assistant. Nia Bartolucci recently graduated from Mount Holyoke College in South Hadley, MA where she received a BA in Environmental Studies with a concentration in ecosystem science. This summer Nia will assist with research, monitoring, and stewardship programs on the reserve. Specifically, she will help with the System-Wide Monitoring Program (SWMP), salt marsh monitoring and restoration projects, biological monitoring (benthic infauna, invasive crabs, osprey, ticks, and vegetation monitoring) and upland stewardship projects. Nia grew up on an island in Washington state and is excited to be able to return to island living. In her free time, Nia enjoys hiking and playing soccer.